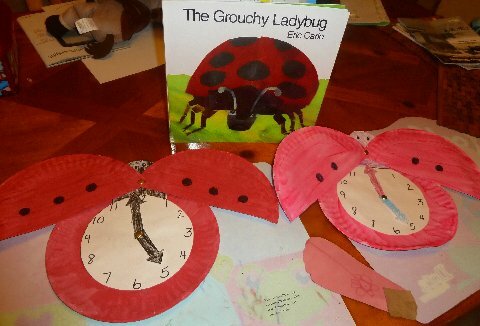 You can't do a ladybug unit without reading Eric Carle's The Grouchy Ladybug and you can't read the book without talking about telling time. 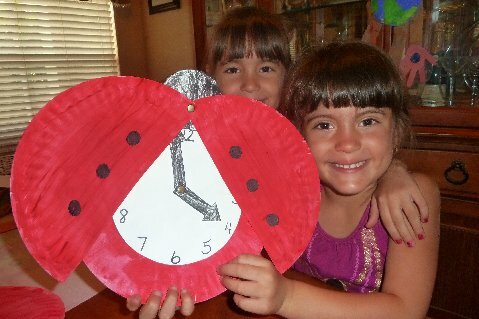 So, I decided to help the girls make our very own ladybug clocks and teach them a bit about telling time. 2. On white construction paper draw circle for clock which measures inner circle of paper plate and add head on top. Cut out entire piece, let child color head in desired color using crayons or markers. 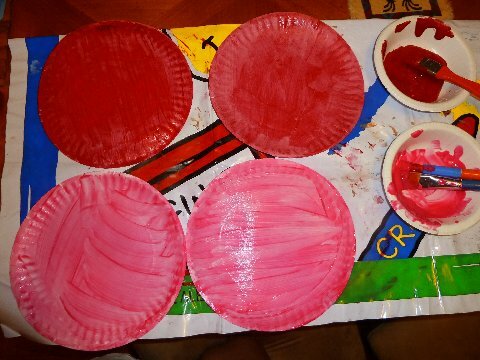 Write numbers for clock and glue onto center of plate. 3. Cut out 2 arrows - 1 small and 1 large for clock hands - and attach to middle of clock on paper plate with brass fastener. 4. Take plate with painted outside and fold in half and cut. Punch hole near top - make sure plates are slightly on top of each other. This will form wings and will open and close to reveal clock in inner plate. 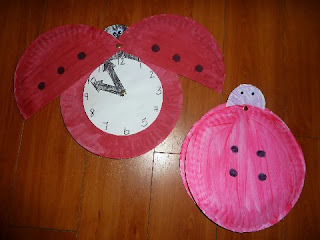 Attach to head of ladybug so that clock is clearly and easily seen when wings are opened. 5. Add dots to top of plate as desired. Read the Grouchy Ladybug and follow along with the times stated in the book on your ladybug clock! Time is not an easy concept to teach to young children. Young children will not master this right away but this is a fun and easy way to introduce them to the idea of telling time. Both my Lil Divas were able to grasp the concept of the hour/o'clock. The Oldest Diva is learning time to the half-hour and knows that the other numbers go in 5 min. increments. Even though she can't tell you what time it is for those times - she has a vague idea of what it should be which is an awesome start. Have you introduced the concept of time to your kids/students? Any fun ideas or tricks you care to share - I'd love to hear about them, just comment below! Hi from HHH! Love The Grouchy Lady Bug. If you are doing a unit on ladybugs, you might want to order live ladybugs and release into your garden. We've done this and my children were thrilled. Have fun with the ladybugs! 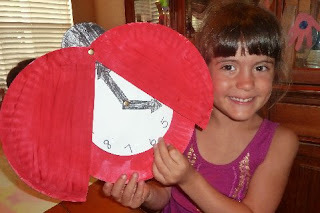 What a fabulous way to combine a craft, reading, and a lesson in telling time! I love this idea!! I am visiting from Tiggerific Tuesday Blog hop and am now following you! You can find me at http://yestheyrallmine.com I hope you have a happy Tuesday! what a great idea, it's been so long since I read that book, I forgot it deals with time as well as ladybugs! I will def be using this idea! Thanks!! Thanks for stopping by my blog as well! Oh my! Clever lady - love the clock and ladybird combination! How fun! This is such a cute idea. I'm definitely saving this for my little one is old enough. What a cute way to work on time! Cute little lady bug craft! Way to make learning fun! Thanks for linking up at Feed Me Books Friday! I love the idea of following along with your craft-clock as you read the book - makes it much more interactive! Cute idea! We just bought the Grouchy Ladybug and I'm going to try this! My mom put times on presents when we were traveling, it helped pass the time and helped us learn to tell time. She also did it for my youngest sister when she was home with the chicken pox. 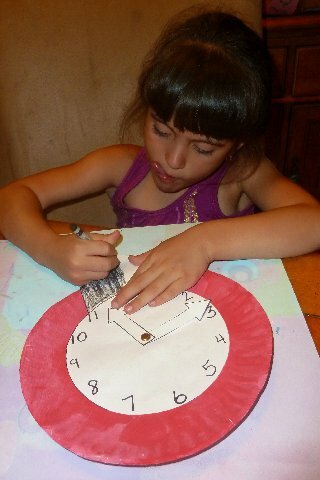 Entertained her while she was home and miserable and by the time she went back to school, she could tell time. What a great idea, and so simple. 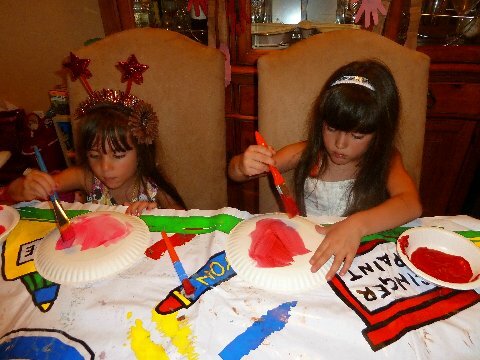 Thanks for sharing this at For the Kids Fridays! I've just passed it onto my facebook friends. This is totally cute! :) Featuring this post at this week's High paw! So cute. I love the fancy head pieces both of your girls are wearing! I need to work on time with Big M...we use digital clocks which makes it so abstract. Great directions on how to make your craft. 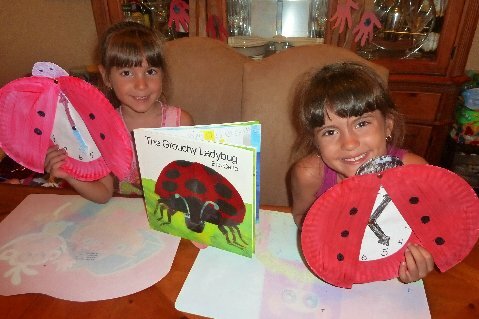 The Grouchy Ladybug is an awesome book.